Product #20769 | SKU JB01325 | 0.0 (no ratings yet) Thanks for your rating! The Joby GripTight GorillaPod XL Stand for Smartphones in black and charcoal allows you to stabilize your smartphone, letting you capture great photos and video. It's also suitable for viewing media or using your smartphone as a GPS device. The GripTight XL fits any phone 6.9 - 9.9cm wide (including case). It has internal steel springs that allow it to expand to the size of your device. Meanwhile, rubber grip pads hold your phone in place securely. Chief among its features is its foldable design -- the legs fold inward to allow you to easily slip it into a pocket or bag and take it wherever you go. 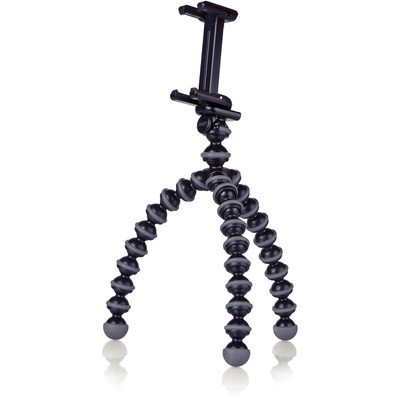 The stand connects to all GorillaPods and most other tripods using the industry-standard universal tripod screw. Plus, a quick-release clip stays connected to the mount for an instant setup. The stand has over 24 leg joints that are able to bend and fully rotate, so you can shoot just about anywhere.